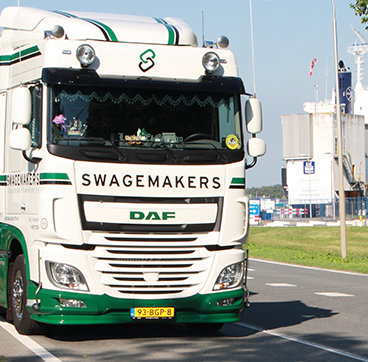 To continually seek connection with other parties, with 100% trust in one another’s expertise, Swagemakers Intermodaal Transport BV has grown over the last 50 years into a knowledge organisation that continually shares its expertise, in order to create a perfect logistical solution for the end client! In other words: connect in trust. We ensure, in collaboration with a number of shipping companies, "door to door" deliveries for our clients, to overseas destinations both within and outside Europe. 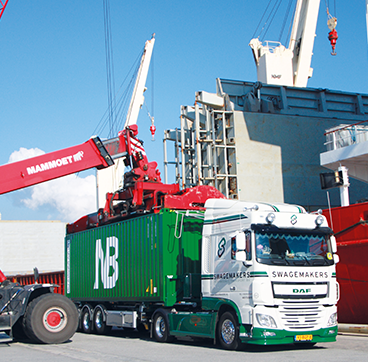 On the basis of years of experience and proper collaboration, we offer an appropriate logistical solution to any country. Via an international rail operator, we are also able to reach a large number of different countries by rail. Furthermore, as a company we constructively contribute to a cleaner environment. Therefore, together with our clients, we make the conscious choice for intermodal transport, resulting in a demonstrable CO2 reduction. We are in possession of a modern vehicle fleet with meets the highest environmental norm. Currently, we are ISO 9001:2015 certified. The aim is to lessen the burden on the environment by these means.